International Master (IM) Jan Emmanuel Garcia, Gold in open under-18 category, Blitz and Standard event, respectively. 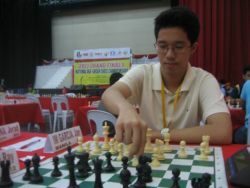 Fide Master Paulo Bersamina of Pasay City, Silver-Bronze in open under-16 category, Standard and Blitz event, in order. Daryl Unix Samantila of Tonsuya, Malabon Bronze in open under-14 category, Blitz event. MANILA — International Master (IM) Jan Emmanuel Garcia lived up to his top billing on Wednesday, after halving the point with Ganesan Akash of India in the sixth and penultimate round and beating Eiti Bashir of Syria in the seventh and final round to become the Philippines’ double gold medalist and put a dent on India’s dominance in the Asian Youth Chess Championship 2013 in Sari, Iran. The Manila resident Garcia, top player of Ateneo de Manila University notched a total of 6.5 points on six wins and a draw in seven outings in ruling the open under-18 category, Blitz chess competition. According to Asian Chess Federation deputy vice president Casto "Toti" Abundo, for 16 players and fewer, they applied Seven rounds Swiss-System. "Masyado pong mabigat ang field na sumali dito kasama na ang pag-dagsa ng stong Indian contingent, China at former Russian Republics na bansa gaya ng Kazakhstan, Uzbekistan, Turkmenistan at Kyrgyzstan" the 2011 Subic Asian Youth gold medallist Garcia informed the National Chess Federation of the Philippines (NCFP) under the leadership of it's chairman/president Prospero "Butch" Pichay Jr. and secretary-general Cavite 7th district rep. Abraham "Bambol" Tolentino Jr.
Patil Pratik Pravin of India subdued Ismailov Mukhit of Kazakhstan to score 5.5 points and settled for silver medal. Le Tuan Minh of Vietnam defeated Ganesan Akash of India to score 5.0 points and went home with the bronze medal. It was the second gold medal for the Philippines' brightest hope Garcia, who also topped the Standard competition after edging Ma Zhonghan of China in a tie break points. Other Filipinos who delivered with bronze medals were Fide Master Paulo Bersamina of Pasay City in the open under-16 and Daryl Unix Samantila of Tonsuya, Malabon in the open under-14. Bersamina split the point with Das Sayantan of India to climb to 4.5 points, 1.5 points behind gold medalist Tran Tuan Minh of Vietnam (6.0 points) and silver medalist Das (5.0 points). The pride of Adamson University Samantila drew with Veerappan Aravindh Chithambaram of India to finish with 5.5 points and take third behind gold medallist Veerappan (6.0 points) and silver medallist Murali Karthikeyan of India (5.5 points). Bersamina posted 6.5 points and also landed second behind eventual champion Koushik Girish Arun of India (7.5 points) in the Standard event. "This is another major achievement for the NCFP in particular and the country as a whole," said National Chess Federation of the Philippines (NCFP) chairman/president Prospero "Butch" Pichay Jr. when informed about the news. NCFP secretary general and Cavite 7th district Rep. Abraham “Bambol” Tolentino Jr. said the success of the young athletes once again proved chess’s lofty record as a certified achiever. “Once again our flag has been raised in this foreign land after knowing that our Filipino kababayans won the coveted gold medals in the Blitz and Standard competition as well silver and bronze medal,” said Tolentino, also the Asian Zone 3.3 FIDE President. Current world youngest Fide Master seven year old Alekhine Nouri of Taguig City is 6th place in the open under-8 in the Blitz event and 7th place in the Standard play. The country's campaign in the tournament is supported by the National Chess Federation of the Philippines (NCFP), Philippine Sports Commission (PSC), Philippine Olympic Committee (POC) and Bayan Muna Party-list group.